If you are a parent living in Delhi who has fought a battle of nursery admission or is a parent who would do that in near future, the film Hindi Medium is your story. Having covered the nursery admissions in the last one decade as a journalist and now a parent myself, I can say that getting a nursery seat is a herculean task in Delhi. The film shows the real-life experiences of parents and the problems thousands of them face every year, with a dash of humour. The film, starring Irrfan Khan and Pakistani actress Saba Qamar, shows the plight of parents who aspire to send their daughter to an English medium school. Probably the first film made to highlight the flaws of education system, it points out at the need to reform the education system. It shows that education, which is supposed to be a not-for-profit activity and right of every child, has emerged as a big business opportunity. While the film will release on May 19, a screening was organized on May 13 for deputy chief minister of Delhi Manish Sisodia, who handles the education portfolio, and the department of education. The government-run schools across India are in bad shape. Shortage of classrooms, insufficient teachers and low learning levels are some of the problems they have faced over the years. They have been left to decay for a long time. It is because of the poor standards of such schools that parents have shifted to private schools. More children and less number of good quality private schools; the nursery admission blues has become an annual problem since the private schools got autonomy. And it has become challenging for parents to score a seat for their child in the city. The film is about a couple who dream to give the best education to their daughter and the problems they face. Irrfan Khan portrays the role of a father with a daunting task in hand. A businessman from Chandni Chowk in central Delhi, he wants his daughter to get admission in a reputed school in Delhi. He is ready to do anything. From changing house and moving to a posh neighbourhood in south Delhi to come within the 3 km radius of the school, to bribing the school principal and asking an MLA for help, he leaves no stone unturned. The couple also hire a consultant for this. But still do not manage to get admission. Meanwhile, his worker’s son gets admission in a reputed school under the quota reserved for economically weaker section (EWS). When all other means fail, he decides to take the EWS route. The film highlights the pressure build up on children to speak in English and how education is creating a divide within the society. It also points out at the increasing ambition of parents from EWS to send their children in English medium schools. 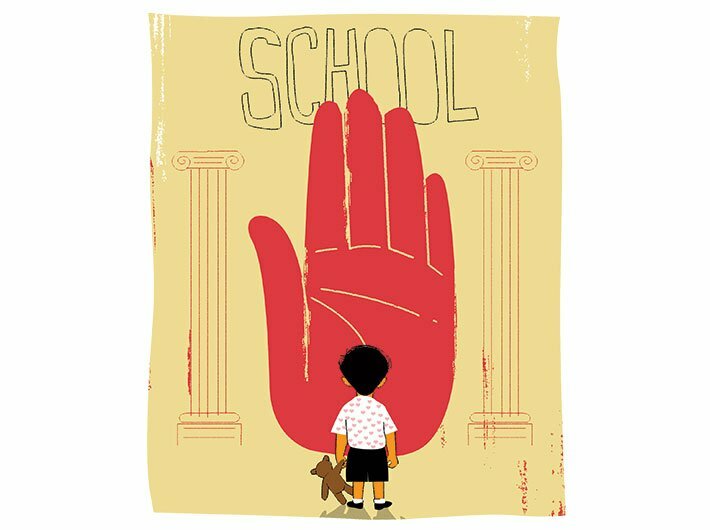 The RTE Act mandates reserving 25 percent seats for such children, but corruption and scams act as roadblocks. Manish Sisodia said that the film has shown the reality and that is why the government of Delhi is working hard to solve the problem. He said there is a need to focus on the quality of government school education and the government must develop a strong alternative to private schools. He added that the stigma attached to the government school will take time to go. Sumit Vohra, founder of admissionsnursery.com who has also written a book on this, said that the book is based on real life experience of parents. Atishi Marlena, advisor to Manish Sisodia, also attended the screening. She said that the film is excellent portrayal of the education crisis in Delhi. Marlena also said that the government is working to make the process of nursery admission in private schools more transparent, and also improving the quality of government schools is the way ahead.